I've always been drawn to zombie movies, since I first saw George Romero's the Dead movies and the numerous interpretations of the genre particularly that of Max Brooks (World War Z), Alex Garland (28 Days Later & 28 Weeks Later) and Robert Kirkman (The Walking Dead). Zombie movies function as a mirror to our collective values and pretenses on matter of survival and being human. It dares to put us in the middle of the tension between living to fight another day in an eternity of living dead; asking us whether it is actually us the survivors who are the real walking dead for we are no longer different from the zombies who are driven by the primal urge to press on living at the expense of others lives. 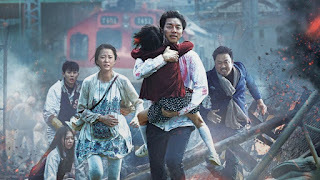 It is on this theme of the zombie movie genre that I find Yeon Sang-ho's Train to Busan a welcomed contribution to themes advanced by the zombie genre. I find it special because it saliently functions as a Marxist social commentary to the conventions of class relations, that is more relatable than George Romero's take on the idea in his movie Land of the Dead.